We combine the 11 and 12 year old levels into a single league. This is baseball played on a 50/70 field, which means the pitching distance is from 50' and the bases are 70' apart. The entire line up bats, however there are only 9 defensive players on the field at a time. This means the coach must distribute playing time while continuing to develop the skills of players. Evaluations are held in early March in an attempt to competitively balance the teams. Teams are selected through a draft process with the evaluation information available to all coaches. Practices begin immediately and depending on the calender the games generally begin in mid-April and run through playoffs in mid-June. Skills that are focused on at this level include more advanced pitching and catching skills as runners are allowed to take leads and steal. 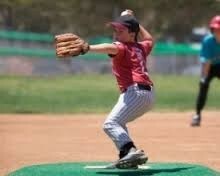 Base running skills are emphasized as well as continued hitting, throwing, fielding, and proper positioning. Players are expected to bring a glove and while not required, baseball pants and cleats are a plus. During the season additional tryouts are held to create 11u and 12u District teams. These teams represent Egg Harbor Township in the Cal Ripken tournament trail which at some age levels could lead to a World Series. In addition these teams play in other local tournaments.